Music ministry plays a vital role in the worship life of House of Prayer. We are so thankful to the individuals who participate in the music groups here, sharing their talents as we all give praise to God. Here are some of the groups you'll hear at House of Prayer - note that we are always happy to welcome more people into any of these groups! This group rehearses on Wednesday evenings from fall through spring. They sing most Sundays for the 9:30 service and other church holidays throughout the year. Beyond singing choral anthems of the traditional nature, the choir takes on a much broader role in worship leading hymns, liturgy, and other music as well. Contact Phil Mennicke for further info about the Adult Choir. One of the rare but exciting things we have at House of Prayer is a full concert band! This group plays in worship about four times a year, plus the annual Festival of Carols, and rehearses as needed leading up to those events. Contact Jon Kietzer for more info about the House of Prayer Wind Ensemble. It shares many members with the Northern Winds Concert Band, a community band that rehearses at our church and is conducted by one of our members - Joe Speakman (check out the NWCB website here). Each week before their lesson, the Sunday School children take some time to sing, dance, and play with Mindy Mennicke. Several times throughout the year they share their songs in both worship services and it's always moving to hear their enthusiastic praise. Contact Ben Whalen for more information about Sunday School music. We also feature guest musicians from time to time! If you or your group would like to share your music with our congregation, please contact Phil Mennicke. Check out our 11:00am alternative worship service each Sunday: ReFuel. Josh Countryman leads the worship team for this service and is always open to new singers and musicians. Be a part of an awesome variety of music from Christian praise and worship music to rock and roll! Contact Josh if you're interested! 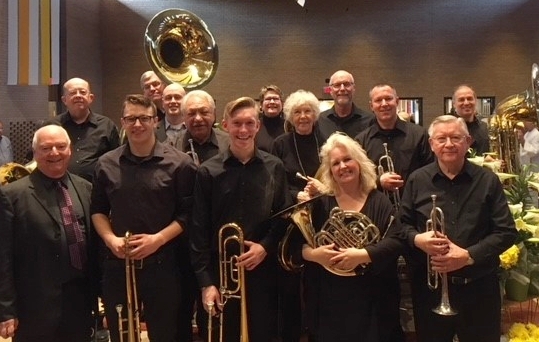 The Brass Ensemble typically rehearses Wednesday or Thursday evenings at 7:00pm and plays at the 9:30 worship service about once a month (plus special occasions). New members are always welcome to join! Contact Jon Kietzer for further info. This year marks the 31st(!) anniversary of the inception of this fun group. As always, the hand bells will strive to provide music of the highest artistic quality to enhance and inspire our worship life. The bells rehearse Monday evenings and typically play once a month for Sunday worship, plus other events throughout the year. Contact Phil Mennicke for more info. Each December our many musical groups create this spectacular service of music, song, and readings to tell the Christmas story in a powerful way. Contributing groups include the Adult Choir, Hand Bell Choir, Northern Winds Concert Band, and House of Prayer Wind Ensemble. In 2017 our theme was "All Earth is Hopeful." As you can see, there are plenty of ways for you to share your talents to enhance the worship life of House of Prayer. Please take a moment to consider which of these might be the best fit for you — they each present an opportunity to meet and work with some super people, and ALL are tons of fun!